Inspired by Ginny: ~ Two of my favorite things are knitting and reading, and the evidence of this often shows up in my photographs. I love seeing what other people are knitting and reading as well. So, what are you knitting or crocheting right now? What are you reading? I have a modest collection on knitting books for children, and keep them on a special shelf near my yarn. Every special once in a while, PB asks if we can “read a knitting book,” and we choose one to read together. 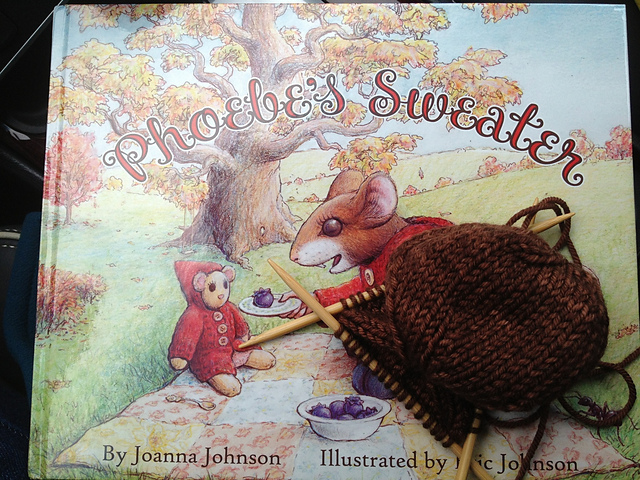 Recently she requested we read Phoebe’s Sweater, a beautifully illustrated book by Joanna and Eric Johnson. After the story, there are some beautiful knitting patterns for a girls sweater and a large stuffed mouse doll with a matching sweater and dress. I’ve always wanted to make PB the sweater, but on this day it was the darling mouse that caught her eye. Mama, will you knit me this mouse please? Sure, sweetie. What color should it be? Let’s look in your yarn cabinet, mama. Be still my heart! We proceeded to look through the stash and discuss color options, and she ended up insisting upon a relatively new-to-me skein of Madelinetosh Vintage in Moccasin. I tried to convince her of other options, but she would not be swayed. And she’s right; this chocolate-brown yarn was the best choice for a little mouse, perfectly matching the weight and yardage requirements. Phoebe Mouse is a quick, seamless (except for the ears) toy, something I haven’t made before. I’ve finished the body since taking this picture on Monday, and am on to the extremities. The best part is, every couple of days she asks me to sit down and work on her Phoebe Mouse. Gladly my dear, gladly. ps. The Johnson’s have since published two more, equally charming children’s books: Freddie’s Blanket and Phoebe’s Birthday. View them here. I need to get that book! My daughter is 6 months old and I have been reading “Extra Yarn” to her. I would like to have a whole category of yarn-related children’s books. “Annie and the Swiss Cheese Scarf” also looks really good. Any other knitting kids books you would recommend? Sonia, I look forward to your mouse! My youngest loved mice (and often was one) when he was small. I knit him a mouse that I Frankensteined from Debbie Bliss’ “Toy Knits,” using a teddy bear’s body and a pirate rat’s head. We named him Wocket, and he and Ryan had matching sweaters. Memories! What a wonderful book! I’m going to have to add it to my collection. I can’t wait to see your mouse in the end, too.